Miss Burma tells the story of modern-day Burma through the eyes of Benny and Khin, husband and wife, and their daughter Louisa. After attending school in Calcutta, Benny settles in Rangoon, then part of the British Empire, and falls in love with Khin, a woman who is part of a long-persecuted ethnic minority group, the Karen. World War II comes to Southeast Asia, and Benny and Khin must go into hiding in the eastern part of the country during the Japanese Occupation, beginning a journey that will lead them to change the country's history. After the war, the British authorities make a deal with the Burman nationalists, led by Aung San, whose party gains control of the country. When Aung San is assassinated, his successor ignores the pleas for self-government of the Karen people and other ethnic groups, and in doing so sets off what will become the longest-running civil war in recorded history. Benny and Khin's eldest child, Louisa, has a danger-filled, tempestuous childhood and reaches prominence as Burma's first beauty queen soon before the country falls to dictatorship. As Louisa navigates her newfound fame, she is forced to reckon with her family's past, the West's ongoing covert dealings in her country, and her own loyalty to the cause of the Karen people. 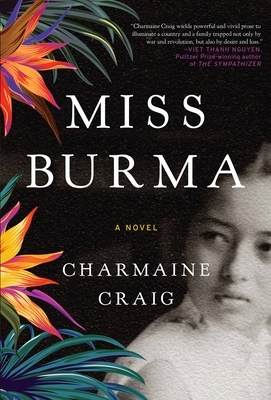 Charmaine Craig is a faculty member in the Department of Creative Writing at UC Riverside, and the descendant of significant figures in Burma's modern history. A former actor in film and television, she studied literature at Harvard University and received her MFA from the University of California, Irvine. Her first novel, The Good Men (Riverhead), was a national bestseller translated into six languages.